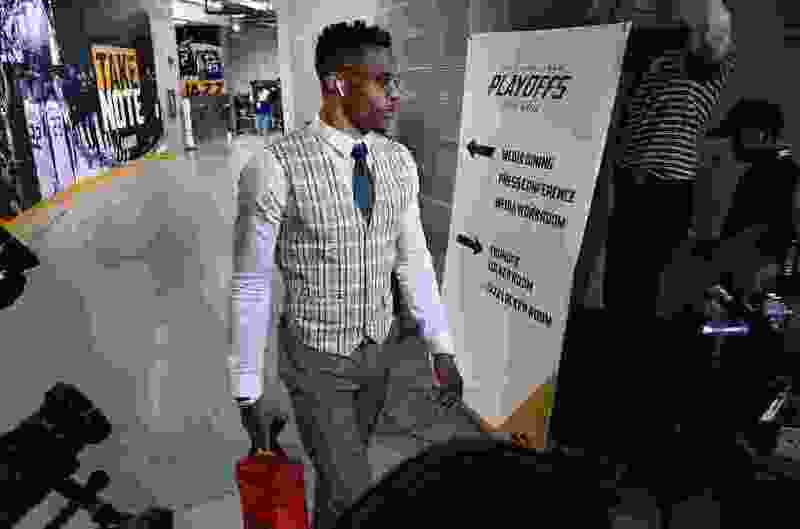 (Scott Sommerdorf | The Salt Lake Tribune) Thunder forward Russell Westbrook arrives before Game 6 of the first round playoff game between Utah and Oklahoma City, Friday, April 27, 2018. People can be idiots. Especially when they pay hard-earned cash to buy a ticket to get a seat in an arena to watch their team play — and root it on — against dastardly infidels, decked out in different-colored tank-tops and shorts and sneakers from some other city in some other state in the NBA playoffs. Here’s a shocker: A few of them are really mean, saying things, screaming things at human beings — tall, fast, athletic, talented, rich, famous ones — they’d never say or scream in any other place. And any number of those things could be considered rude, low-minded and boorish. There are a few ways a player on the receiving end can go with all of that. He can get upset and act out, he can laugh and turn away, or he can shut them up by beating their team. When the Jazz bumped the Thunder out of the playoffs Friday night, the prized student — Donovan Mitchell — taught the veteran master — Russell Westbrook — valuable lessons in that regard. But the master wasn’t of much mind to listen. He already had heard too much. Seconds after scoring 46 points on 18-for-43 shooting for the Thunder and getting eliminated, as he was leaving the floor at Vivint SmartHome Arena, a frustrated Westbrook stopped and took a swipe at a fan holding a phone. If he had full-on connected, it would have cost him a whole lot of money, and it still might after review. He mostly missed, and it seemed to cost him his ability to think straight, his feelings hurt the way they were, although that might have been long gone. The NBA’s reigning MVP went off on Jazz fans when asked about the swipe afterward. “I didn’t confront the fans,” he said. “The fans confronted me. Here in Utah, a lot of disrespectful, vulgar things are said to the players here with these fans. They are truly disrespectful, talking about your families, your kids. It is a disrespect to the game, and I think it is something that needs to be brought up. Mitchell, a celebrated rookie, but a rookie nonetheless, led the Jazz to the series-clinching win with some remarkable play, including scoring 38 points on efficient 14-for-26 shooting. The degree of difficulty on some of his shot attempts was ridiculous. Either way, Mitchell, who caught some attention when he interacted with Thunder fans while coming off the court after a Game 5 loss in OKC, saying, “We’ll see you next year,” implying that the series would end Friday night in Utah, was asked about Westbrook’s comments and whether the Jazz crowd is particularly disrespectful and vulgar. He did. He laughed out loud. And then he said: “I wouldn’t say it’s anything crazy. My two years in college, I heard crazy things, too, but it’s part of the game. I wouldn’t say specifically that it happens here. It happens everywhere. I heard it last game [in OKC]. I think it’s just part of the game. It makes it fun when you have the crowd yelling at you. Sometimes it does go overboard, I’m not saying that’s what happened, but you’ve just got to maintain composure. Donovan Mitchell also fielded this question about if he feels Utah fans are more “disrespectful” than anywhere else. He said he hears lots of stuff in lots of places. Of course it’s not just a Utah thing. It’s an Oakland thing, a Philly thing, a Cleveland thing, a Houston thing. The fans here just happened to be the ones on this occasion enjoying the moment, popping off, some of them being idiots, just like the fans everywhere else are. There’s no denying, some of it really is crass and cruel. Sometimes things are said in the heat of competition. Things that wouldn’t be said if, as Russ pointed out, the folks saw him on the street. That’s just the way it is. You take in the cheers and the jeers. You turn and play on, you turn and smile, you turn and walk away, or you turn and win. In his first year in the league, Mitchell knows this. It’s surprising that Westbrook, in his 10th, does not. Gordon Monson hosts “The Big Show” weekdays from 3 to 7 p.m. on 97.5 FM and 1280 AM The Zone.